Perhaps not surprisingly, the majority of books celebrating Thoroughbred legends invariably invite the reader to “rank” equine athletes gracing the pages across the timeline of racing history. It is only natural to dream up scenarios in which the all-time greats meet each other in a hypothetical race, as we have seen in the past six months with speculation as to how American Pharoah stacks up against Triple Crown heroes of the past. Yet there is something to be said for cultivating an appreciation of each Thoroughbred within its own context, resisting the urge to make comparisons and instead focusing on what made each racehorse exceptional. 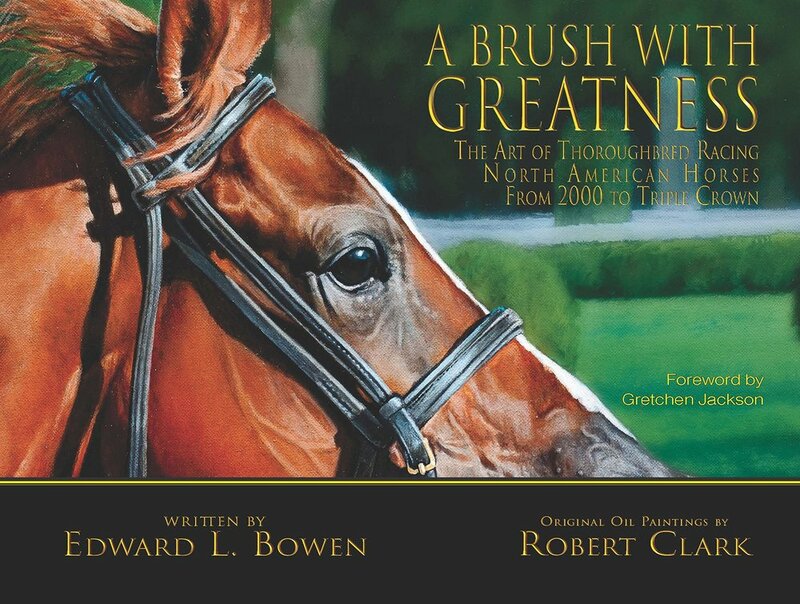 This is precisely what A Brush with Greatnessachieves: it is an ode to the greatest equines to grace the racetrack since 2000, brought to life through the paintings of noted artist Robert Clark, the essays of Eclipse Award-winning writer/historian Edward L. Bowen and, perhaps most extraordinarily, reminiscences from owners, trainers, and jockeys that Clark has connected with over the years. Clark and Bowen mean to recognize not only Thoroughbreds who left a long-lasting legacy after a successful or “great” career, but also those who achieved “a brush with greatness” on a single day, simultaneously reminding devotees why they love the game and capturing the imagination of prospective new fans. At its heart, A Brush with Greatness is a book of memories, meticulously gathered and shared in an appealing format. The double-page spreads would look very different–and would be far less compelling–if each horse was represented by a photo and a mere recitation of facts and statistics. Meshing the artistic renderings of Clark with free-form histories by Bowen and anecdotal reflections by the connections of the horse, the alphabetically arranged essays place less emphasis on quantitative comparison and invite readers to appreciate each Thoroughbred individually. Not long after opening this 176-page hardcover, readers encounter the most recent and likely most-celebrated addition to the pantheon of Thoroughbred greats: 2015 Triple Crown victor American Pharoah. But three page-turns later, readers can recall or familiarize themselves with the career of the gritty gelding Awesome Gem–particularly his pinnacle victory as a 7-year-old in the 2010 GI Hollywood Gold Cup. While Awesome Gem began his career months after others from his crop already completed the Triple Crown events, the venerable competitor went on to make 52 starts, racing until the age of nine. Undoubtedly, his brush with greatness was just one moment in the long-lasting artistry of his career and life story. In a similar fashion, Clark depicts Awesome Gem in full flight to the wire in the Gold Cup, motoring to the greatest triumph of his career with David Flores in the irons, donning the familiar silks of West Point Thoroughbreds. Indeed, all of Clark’s paintings are meticulously rendered; a glancing eye may believe that they are in fact photographs. But upon a closer look, it becomes apparent that Clark is well-acquainted, not only with the physical conformation of the equine in motion, but also with the colorful nuances of the racetrack environment–from exacta pools on the toteboard to shadows cast by a shrubbery row in the infield. The physical articulation of each horse is augmented by Bowen’s finely tuned colloquial recollections, remarkably repeated with the same attention to detail for each of the book’s 79 entries. Text-box reminiscences from owners, trainers, and jockeys further distinguish A Brush with Greatnessfrom other offerings in its genre. Alternately factual, amusing, and deeply moving, these anecdotes contribute to a better understanding of what made each horse’s career–or a particular moment in that career–special. The reflections of Gretchen Jackson–who also penned a foreword for the book–on the career and tragic ending of her colt Barbaro are particularly poignant, allowing readers to view the beloved Derby winner from the perspective of an adoring owner. In his introduction, Clark aptly asserts that “the timing of this book could not be more perfect,” in a year when racegoers and industry stalwarts alike witnessed a remarkable piece of history created by American Pharoah. At a moment in time when the urge to create a hierarchy of the greatest Thoroughbreds is running high, A Brush with Greatness proffers a refreshing, utterly beguiling alternative history, one that conveys deep admiration and respect for both the breed and the individual horses who create memories that will not soon be forgotten.